An "electronic taster" for coffee has been developed by Swiss researchers. The food industry regards machines like this as essential for good quality control. Coffee presents a real challenge; roasted coffee aroma is composed of more than 1000 volatile organic compounds. The researchers started by having a team of ten trained human taste testers go over a set of samples, and assess the taste and aromatic qualities of the coffee. The espresso coffees selected for this study were blended mainly from different Arabica varieties with some Robusta. 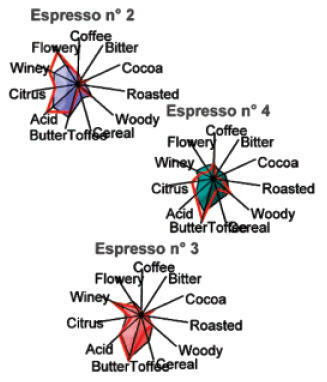 They used a Quantitative Descriptive Analysis, consisting of nine aroma and two taste attributes scored on a scale ranging from 0 (not intense) to 10 (very intense) for each product by monadic sensory evaluation. They expressed their judgment in terms like roasted, flowery, woody, and toffee. The researchers created a device that would heat a sample of espresso and then analyze the gases released by monitoring the headspace over the device. The chemical information was then translated into the taste qualities used by the human judges. The result for each sample was a unique profile (see profiles below). The red colored outline represents the results of the human testing. 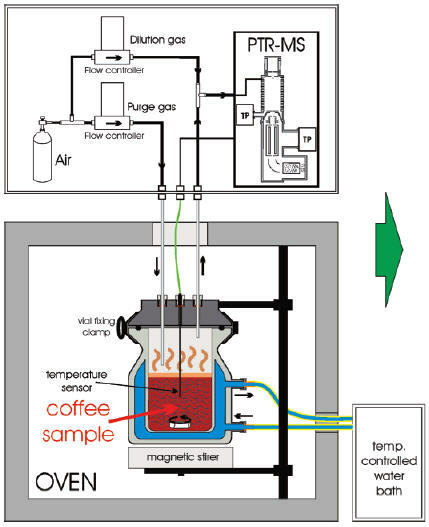 The coffee-tasting machine research will appear in the March 1st issue of ACS' Analytical Chemistry. From When Machine Tastes Coffee: Instrumental Approach To Predict the Sensory Profile of Espresso Coffee [pdf] via Eurekalert.